Twitter Co-Founder Biz Stone Gives App Makers Some Cause For Worry : All Tech Considered "There's a natural tension when you look at platform companies and then third parties that come in and work on a platform," says Twitter co-founder Biz Stone. 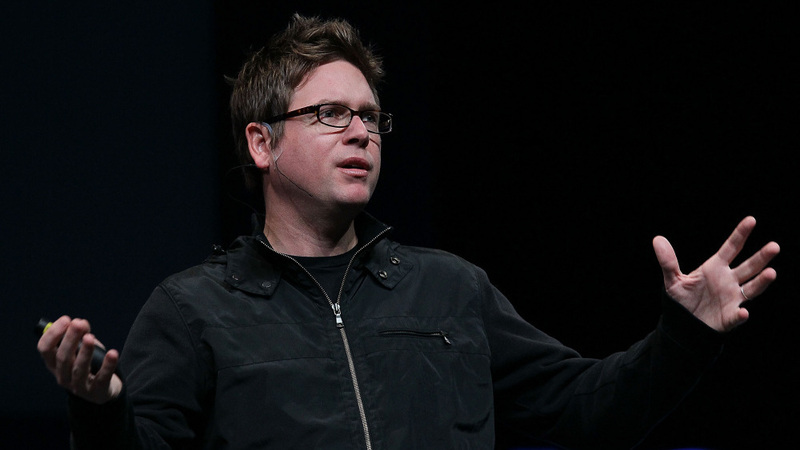 Twitter co-founder Biz Stone speaks during the first annual "Chirp," Twitter Developer's Conference in San Francisco. In 2009, Stone was added to the Time 100, a yearly list of the world's most influential people. Twitter is in day two of its first developer conference, appropriately called "Chirp." Among the big news is that Twitter has more than 106 million registered users. The conference also comes on the heels of some big announcements. First, after years of speculation about how Twitter was going to turn its popularity into profits, the company announced its new plan. It's calling paid-for tweets "promoted tweets." They will appear on the top of Twitter searches. Second, Twitter announced its purchase of Atebits. Atebits is the company that created Tweetie, a Twitter app for the iPhone. Although Twitter hasn't been making much money, developers that have piggy backed on their technology are finding business good. Many worry that Twitter's Atebits purchase is a sign that it may now start to step on them in order to make money for itself. At conference forums in the Palace of Fine Arts Theater in San Francisco, Twitter executives bent over backwards to make sure that developers felt safe. But when I spoke with Biz Stone in a one-on-one interview yesterday, he wasn't nearly as reassuring. "There's a natural tension when you look at platform companies and then third parties that come in and work on a platform," says Stone. Stone gave an example that won't warm the hearts of most developers. In the early days of Apple Computer they sold a computer without a hard drive. "So some companies said, 'You know what we'll do, we'll build hard drives for Apple computers." But, Apple quickly realized that hard drives were a pretty important part of their business. Stone says Apple realized that they needed to put "a hard drive in the computer, otherwise we're underserving our customers." And the guys who were making their hard drives had to find a new business model. Stone says they had to purchase Atebits and Tweetie because "Mobile is in our DNA. We started as mobile. We need to be relevant on the big mobile platforms." It should be no surprise that Twitter announced today that it will be releasing its own Android phone app. Stone insists that the Chirp conference is helping to create a "healthy" relationship with developers. But, it sounds like developers should be careful where they tread.